The Humble Jumbo Bundle 3 is, to put it bluntly, a bizarre collection of games. Not a bad one by any means, just weird, with a mix of games including Always Sometimes Monsters, Tesla Effect, Grid 2, and Saints Row IV. If there's a theme at work here, I can't figure it out. At the "pay what you want" level, with a minimum of $1 for Steam keys, the third jumbo Humble Bundle will provide you with Tesla Effect: A Tex Murphy Adventure, Always Sometimes Monsters, and four copies of Insurgency: one to keep and three to share. If at least one of those shared copies is claimed by December 9, you'll also get the Roguelike Full Mojo Rampage. Beat the average price, currently a bit over five bucks, and the package will be bolstered with Grid 2, Blackguards, Euro Truck Simulator 2, and the super-secret "more games coming soon," which will presumably be announced on Tuesday next week. 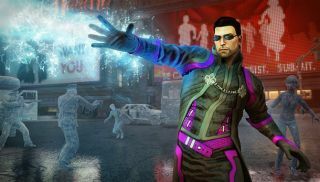 Finally, drop $12 or more, and you can top it all off with the biggie of the bundle, Saints Row IV. Soundtracks for Tesla Effect, Always Sometimes Monsters, Blackguards, and Full Mojo Rampage are also part of the beat-the-average package. Supported charities this time around are Save the Children and Charity: Water, and of course you can slip a few bucks to the Humble guys as well. The Humble Jumbo Bundle 3, the central theme of which continues to elude me, is live now and runs until November 25.